In this release we feature rebranding, beyond the books, continuing education, and new library buildings! No matter how hard we try, for many libraries are about books. And we are, but we’re also more than that. 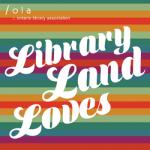 In the first of a series of articles curated by Catherine Coles called More Than Just Books we hear from Joseph Sansalone and the Car Manuals at Oshawa Public Libraries. How do you keep pace with the increasing expectations of library users? That’s the question posed by Dolores Harms Penner and Kathryn Deiter in Up to Date or Out of Date? New Skills for Today’s Libraries. The answer, in part, is the new graduate certificate program at Mohawk College. And finally, a mini-feature on the 2016 OLA Library Building Awards (this year focusing on new library buildings). As Shelagh Paterson, Executive Director of OLA, says: “The award recipients, along with their architectural firms, have created wonderful spaces that have become tremendous community assets. They have shown that libraries can be well-designed places for play, energy, serenity and excitement.” The five winners are featured: Centennial College Ashtonbee Campus Renewal & Library | Toronto Public Library Fort York Branch Library | Haliburton County Public Library Wilberforce Branch| Ryerson University Student Learning Centre | Toronto Public Library Scarborough Civic Centre Branch.